Puremusic: Hi, Tony, this is Frank Goodman. How are you? 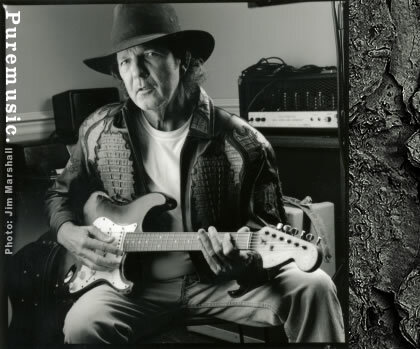 Tony Joe White: Good. How you doing, man? PM: Great. You got a little time for me? PM: Oh, thanks. Man, I love this crazy town. I was just downstairs in the studio talking to the great Danny O'Keefe [the guy who wrote "Good Time Charlie's Got The Blues"] about roasting coffee with a ten-dollar popcorn popper and a Veriac voltage regulator [laughs], and then I come upstairs and get to talk to Tony Joe White about his colorful life. I mean, this is an amazing town. PM: I was thinking that, to me, you have really the ultimate kind of career. You have a huge single when you're young, and enough great cuts through your life to play exactly the kind of music you like, the music of your soul, the whole life long. TJW: Yeah. I've been very lucky, man. Like you say, though, the writing is what kicked all that in and made it possible. It's something that I have always been very thankful of, that that kicked in, and that I could be free with the music. PM: It's a blessing. I mean, of course, it's the blessing of your talent. I always loved the song "Polk Salad Annie." And my brother wrote me this morning when I said I had an interview with you today, and he wrote me reminding me where we were and what we were doing and what we were playing when that came out. [laughs] It really brought it back to life for me. That was an amazing time. TJW: Where was that, where were you guys when it came out? PM: Well, we were playing down the Jersey shore every year. We were teenagers, and just loved that song. Where were you when it came out? TJW: I was in Corpus Christi, Texas. I was playing in a club down there, and had really just gotten back from France. I'd been over there for about eight weeks. I'd had that song that hit, "Soul Francisco." TJW: Yeah, out of the blue. And then all of a sudden I was in Europe, and never been anywhere but Louisiana and Georgia in my whole life. And so here I am in Paris. But anyway, I got back to America, and back to Corpus, and then all of a sudden they said "Polk Salad" was kicking in. So I went, "Man!" PM: Unbelievable. Where did that get in the charts? TJW: It made number four in America, and then number one here and there, different places. But Billboard itself was four. PM: So even though it was to be followed by many great songs, including "Rainy Night in Georgia," was that the biggest song for you ever, the big money maker ever over your lifetime? TJW: No. "Rainy Night," man. PM: "Rainy Night" was bigger. TJW: It's been the deal because there are over 140 versions of it. TJW: And "Polk," I think we got about 60 versions of "Polk." But "Rainy Night" is one of them things for orchestras and everybody covered it. I was real surprised. PM: 140 versions! That's one of the best songs I can ever remember hearing, "Rainy Night in Georgia." It's just one of the greatest songs ever. TJW: I always said that when it ever came up and it got judged right, I was going to get revenge on that song and do it again, do it the way I felt it. The first time I didn't really feel like I nailed it. This time I did. PM: That's a beautiful version on the new record. It's just so deeply soulful. I mean, it's one of those cuts where you feel so much more than the singer, you feel the person. TJW: And you can see the night, man. When we started, my bass player and drummer, and the B3 in my old studio up there in Franklin that night, I told Jody, I said, "I'm going to lay 'Rainy' down, man. It feels like we should." And about halfway through it, it started raining out there, hitting the roof. TJW: And I said, "Well, that's a sign right there we're on the right path. PM: Unbelievable. And was Robbie on the bass that night, Robbie Turner? PM: He's one of my favorite musicians in this town, and anywhere. He's just a remarkable player. TJW:Little Robbie, he plays everything. But most people have no idea how good he is on the bass. PM: Yeah. It's only your record and talking to him about the bass led me to understand that he was a bass player at all. Of course, we use him on pedal steel on a lot of our songs because you just can't find anybody better. But he's a phenomenal bottom-end guy. TJW: Yeah, always, lap steel, banjo--I mean, he can play anything, and has been since he was about seven. But he can get funky on a bass when he has to. PM: [laughs] And just one of the greatest guys. TJW: Oh, God, man, out on the road, your jaws will lock up, he keeps us laughing so long. PM: [laughs] Yeah, no doubt, like yourself, he's a man of many stories. TJW: He's always got an armful of chips.